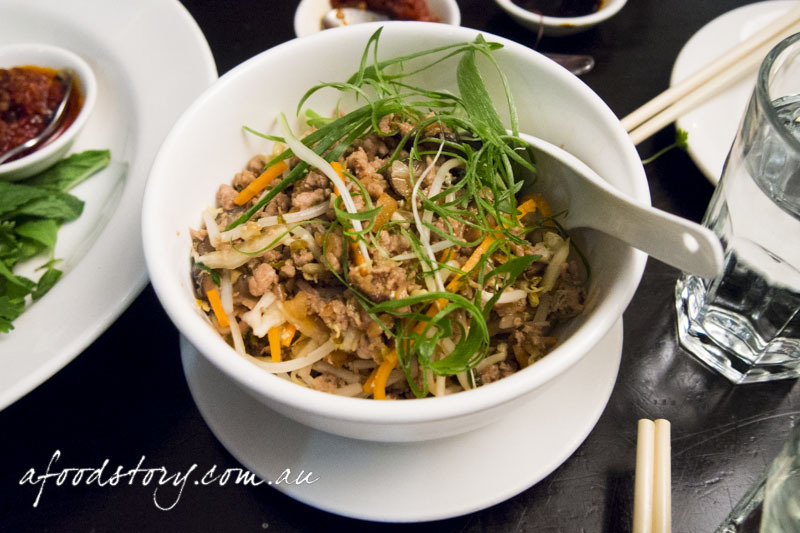 When we got word that Kylie was moving her restaurant to Potts Point we lamented the fact that we had not returned since our very first visit (and very first blog post) nearly 5 years ago. It just so happened we spotted an Instagram by Kylie saying that for the last 19 days of service they would have a special farewell menu comprising the dishes synonymous with the restaurant. Without hesitation we booked (no, we did not know they had taken bookings for some time) our spot ready for one last hurrah in the original location. Kylie’s handwritten specials menu was so hard to read with her large flowing cursive that I had to hand it over to Lex. 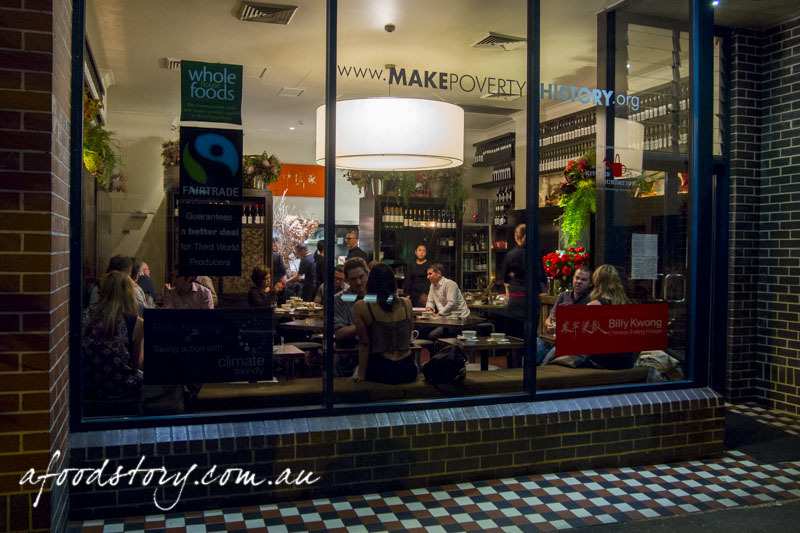 In what ended up being a team effort we got our heads around it and could see it was made up of all the dishes that have been the mainstays on the menu over the years with quite a lot more native Australian ingredients appearing. A lot of the dishes were ones we had tried in our original banquet with a few new classics filling it out nicely. Although we were having the banquet there was no running order given and each dish was introduced as it came. First up were homemade Chinese pickles using Kylie’s grandfather’s recipe. 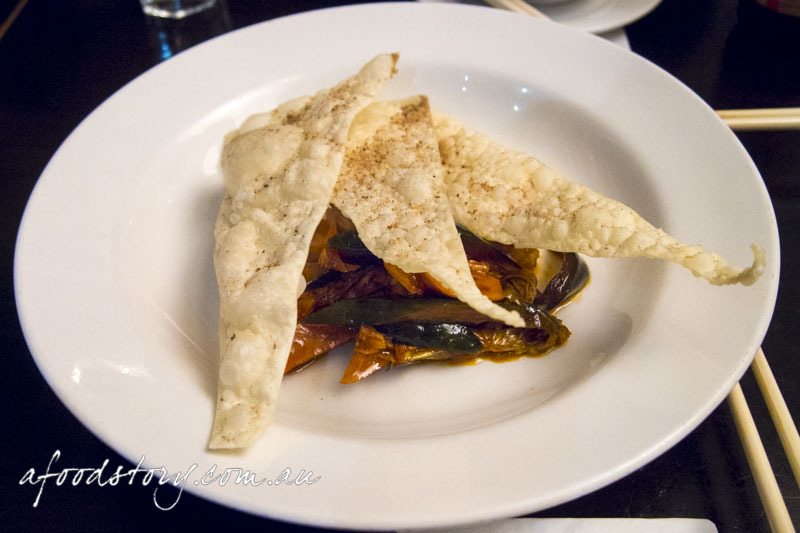 On top were wonton wrappers puffed and crisp with a dusting of pepper. They were mega crunchy and we loved them. All of the vegetables were doused in chilli oil making them nice and warming, and everything was well pickled. There was cabbage, carrot, cucumber, daikon and radish and I was lucky enough to claim almost all of these as Lex and Em are not fans of pickles. 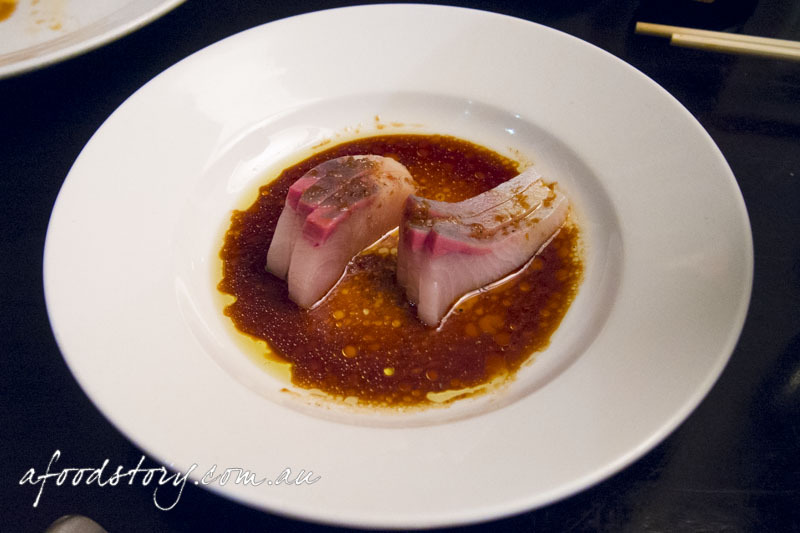 Sashimi of Hiramasa Kingfish with Mat Lindsay’s Dressing. 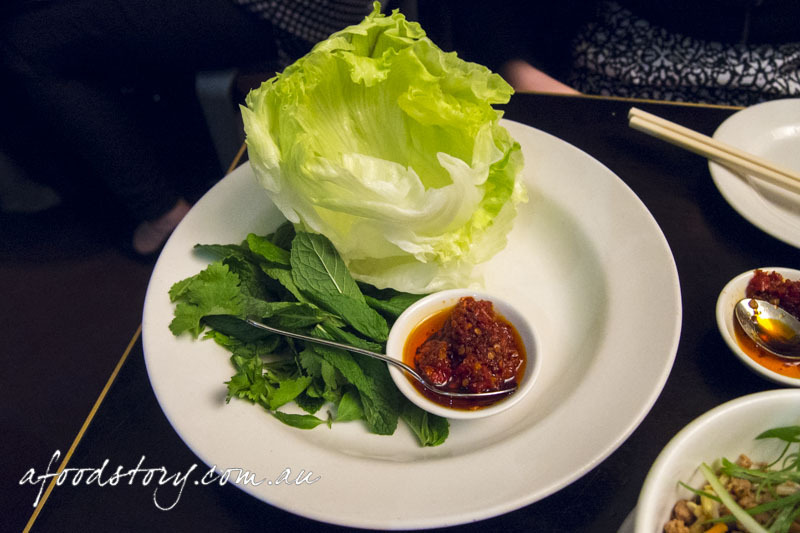 Mat Lindsay’s legacy at Billy Kwong lives on through his amazing sashimi dressing. It is simple with hints of sweetness, some salt from soy and zing from ginger. Dressed in the wonderful concoction was my favourite of all sashimi, Hiramasa Kingfish. Super delicate with its distinctive texture, the sweetness of the fish and the dressing were perfect together while the soy and ginger gave it a little extra depth. Superb. 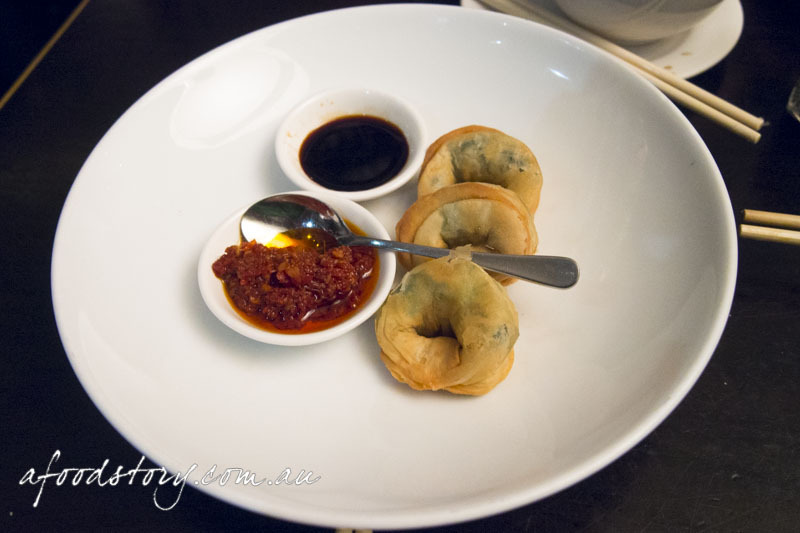 Crispy House Cricket & Prawn Wontons with Sweet Chilli Sauce. Other than being asked if there were any foods or ingredients we didn’t like (Em vetoed oysters) the only other question was if we were too squeamish to try the cricket and prawn wontons. We were all game so next up we were getting our daily dose of insect. 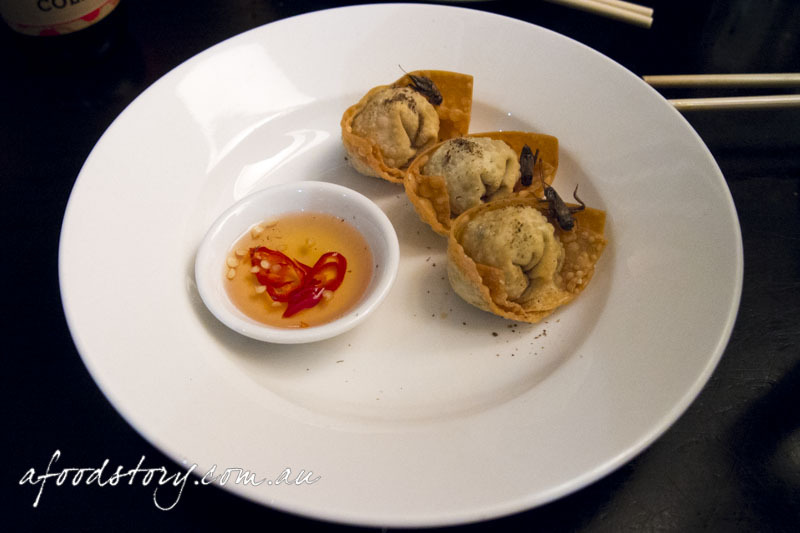 If there was not a deep-fried little critter propped on top of each wonton you would have never know there was anything different about them. After a healthy dip in the sweet chilli dipping sauce I went to get the whole thing in my mouth, but that was a fail, so I bit it in half and was hit with big chunks of juicy prawn meat. 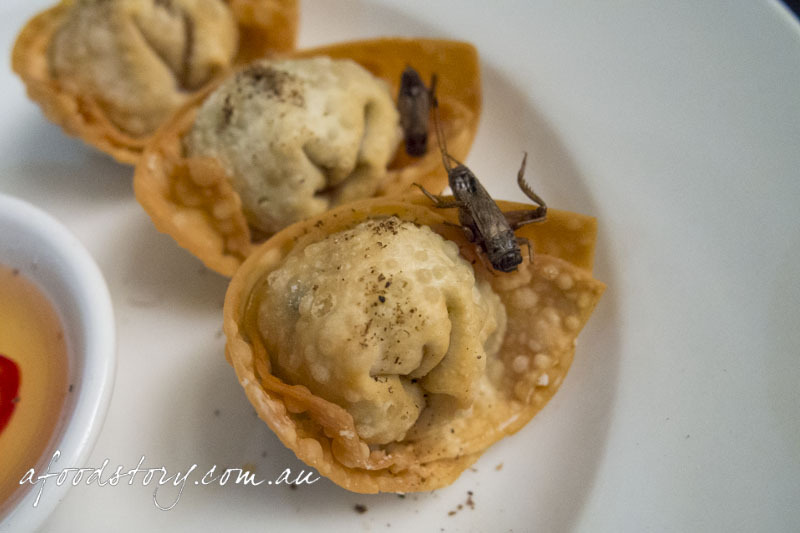 My second attempt included the cricket and to be honest there was no way to tell if it was there or not as the wontons were so crispy and the steamed prawn so flavoursome. 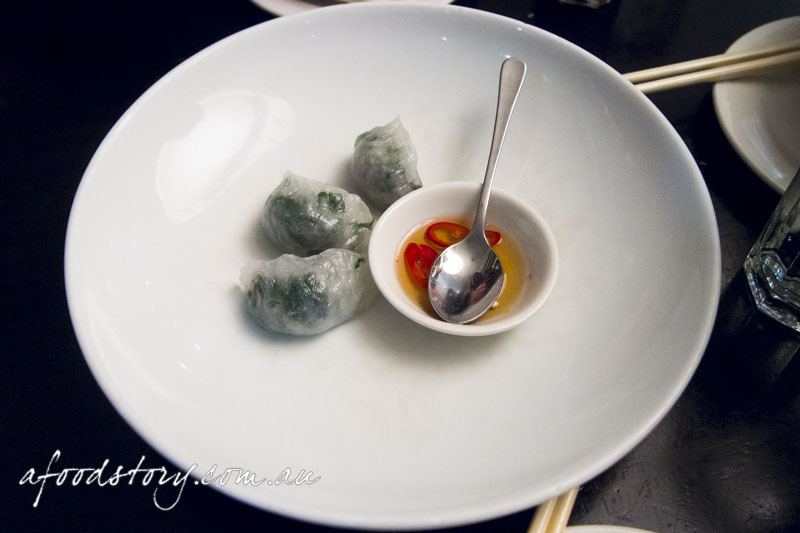 Steamed Vegetable Dumplings with Warrigal Greens. Translucent and piping hot the dumplings arrived and we could see the greens were such a deep rich colour through the dumpling skin, it was evident that it was going to be a great filling. They were lovely soft dumplings and yes the native greens were stellar. The dipping sauce of Shaoxing wine and chilli was just the thing to pair with the herbaceous grassy greens, but I would not recommend sampling the dipping sauce just on its own, it was not as pleasant as I thought it may have been. Crisp Organic Salt Bush Cakes. Continuing along with the native Australian ingredient theme next up we had the salt bush cakes. I’m not sure what I had in mind but they were quite different to what I had expected, the crescent-shaped pastries made with biodynamic wheat flour and lots of butter were crumbly and the filling itself also had great crunch. While the cakes were quite good I was instantly drawn to the housemade chilli that was fresh, packed a little heat and was something I wanted to put on every dish that we had coming up. Wok Fried Rice Noodle Rolls with Beef & Black Bean. When reading the specials menu I misread the description of the noodle rolls and had thought these were going to be egg rolls so as they arrived my perplexed look had Lex needing to explain they were rice noodle rolls, fried off in the wok to make the silky noodles crisp on the outside. Inside there was a marvellous little stuffing of braised beef, mushrooms and shallots and on top a black bean sauce, celery cress and super fine threads of chilli. 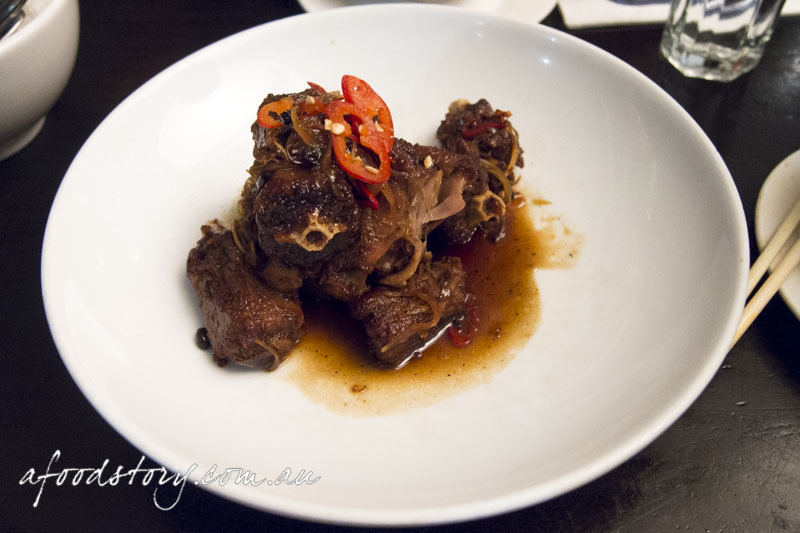 These were superb, one of my favourite Billy Kwong dishes to date. Sung Choi Bao of Certified-Free Range Pork, Ginger & Mushrooms. With the minor morsels done it was time for the more substantial dishes to start flowing and first up was the pork sung choi bao an all-time favourite of mine and something I make versions of at home quite often. Iceberg lettuce cups at the ready I loaded up on more of the magical housemade chilli, some mint and coriander and then stuffed as much of the juicy pork filling in as I dared. Making a right proper mess is how I think you must eat sung choi bao, either that or I am terrible at eating it correctly. Light on the flavourings it was really all left to the pork to shine and be accentuated by the spice from the ginger, earthiness of mushrooms, sweetness of carrot and clean crunch of bean sprouts. Homestyle Fried Biodynamic Eggs with Organic Tamari & Homemade XO. 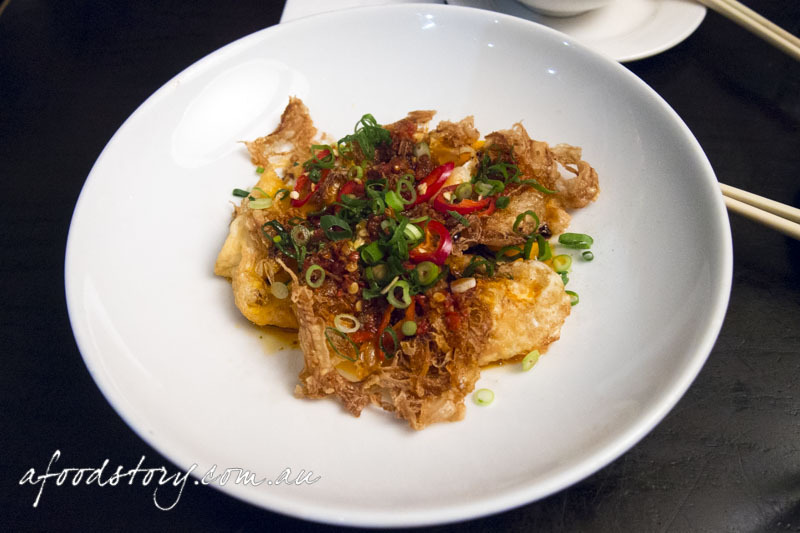 Of all the dishes at Billy Kwong the fried egg was one Lex & I had been hoping would make it onto the banquet menu. When we saw Kylie making this dish on Kylie Kwong: Heart and Soul we knew we had to try it one day. It seemed this was our lucky day. So simple yet stunning there are so many adjectives to use for the eggs: crisp, fluffy, gooey and runny are just a few, and all of them things that this dish is, and all at the same time. Not only did we have amazing egg there was a kick from the chilli and wonderfully rich XO that both complimented the sensational egg. Steamed Fillet of Snapper with Ginger & Shallot. A dish that both Lex & I were very familiar with was the steamed snapper. 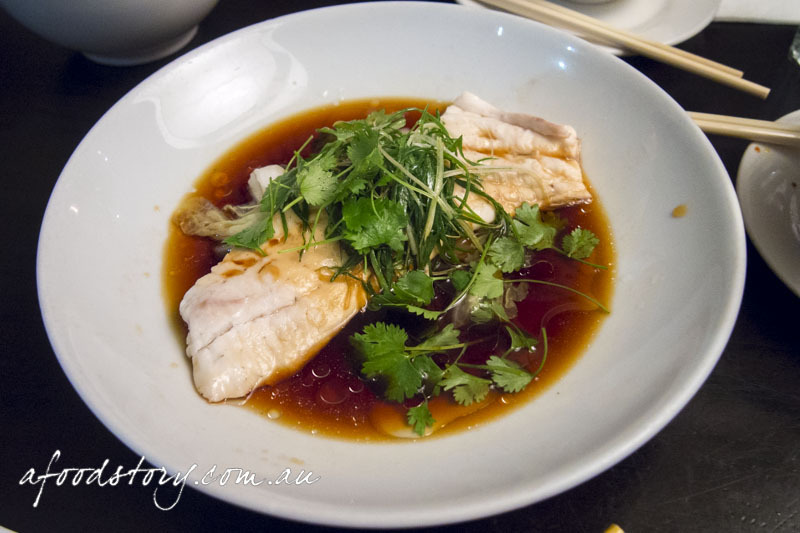 When we were on the hunt for different ways to cook fish at home we came across this recipe in Kylie’s Simple Chinese Cooking and after a very successful first attempt we proceeded to make it on a regular basis. Of all the types of fish she suggests to use snapper is by far the best option, it steams marvellously and when done just right it comes apart in large flakes and is ever so silky and delicate. Both the shallot and coriander lift the dish but my favourite is the white pepper and ginger combination that really seals the deal for me with this one. Steamed Organic Chinese Greens with Organic Tamari. What would a banquet be without a plate of lovely steamed greens? 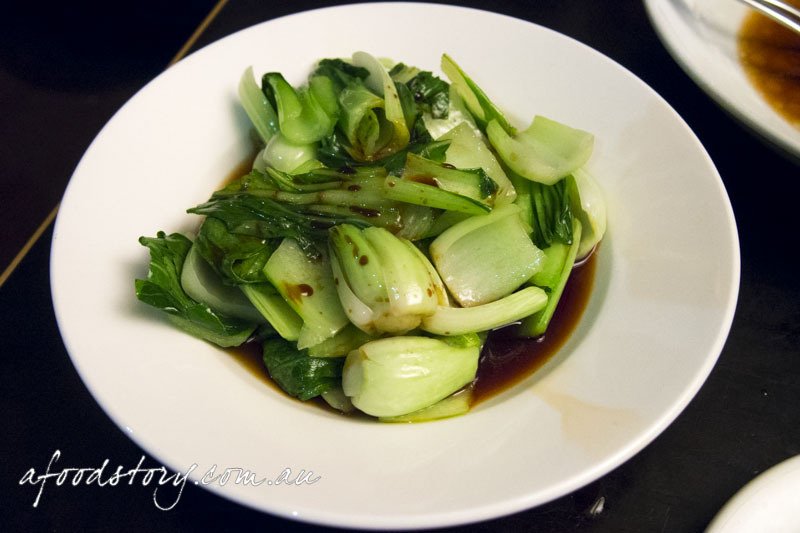 Swimming in an organic tamari dressing the bok choy, gai larn and choy sum each added their own nuances to a dish that is the perfect lead up to the more heavy mains that were to come. 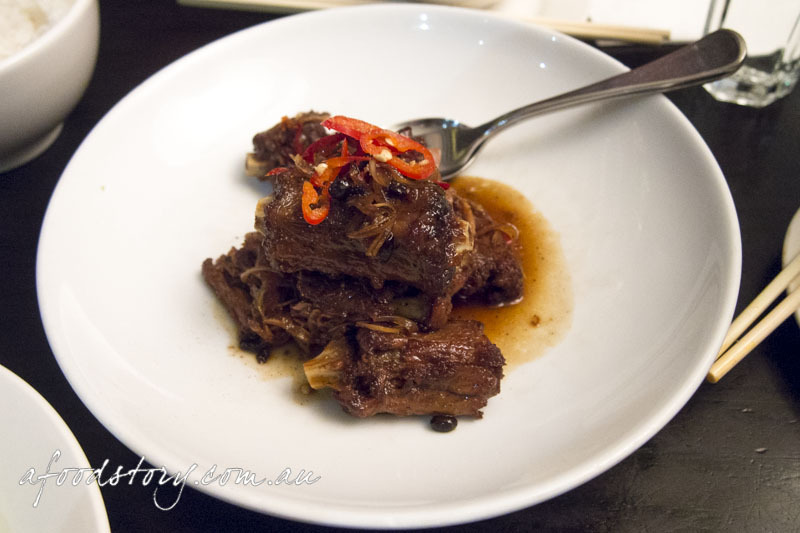 Red-Braised, Caramelised Flinders Island Wallaby Tail with Black Bean & Chilli. When it comes to Australian ingredients wallaby would have to be up there as one that I doubt very few people would have ever thought of as a food let alone dined in a restaurant that served it. 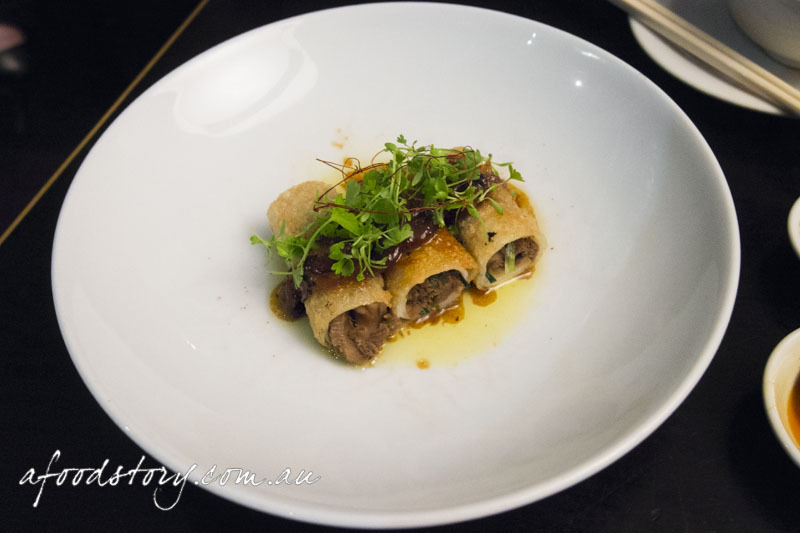 Lex & I had our first taste of wallaby at Vue De Monde in 2013 and we had heard of Billy Kwong serving it not too long after that. Treated in much the same manner as you would ox tail, the wallaby tail was slow braised for hours and served in a rich broth and topped with a generous amount of black beans. Again as with other cuts of this kind the meat fell apart at the slightest touch and was rich and juicy. It was a nice dish but my two issues were that the flavour seemed to be masked too much behind the black beans, and there were so many bones that it took some work to pick through to the good bits. 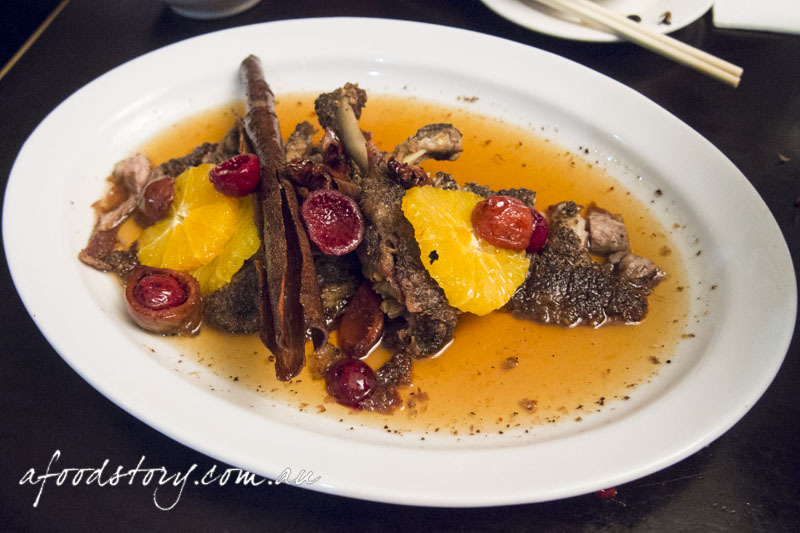 Crisp Skin Duck with Orange & Quandong. And finally the pièce de résistance was the infamous crisp skin duck. 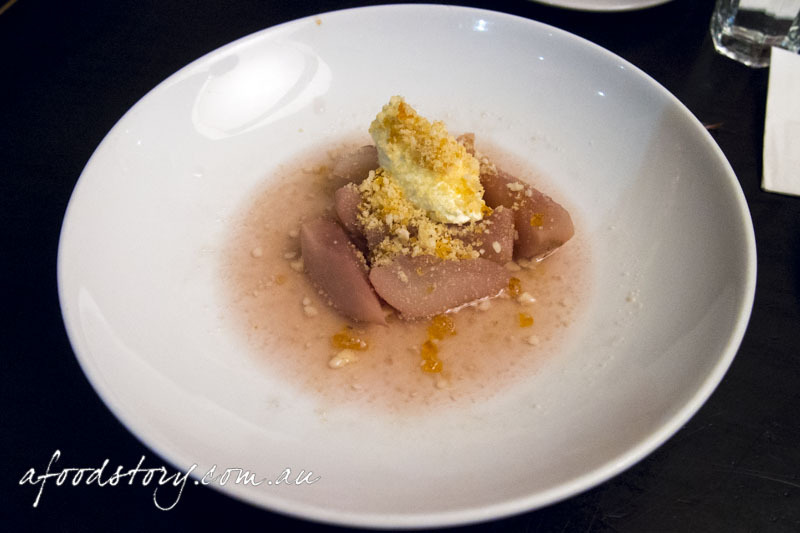 This revision’s main point of difference was the addition of yet another Australian native the quandong, and the unique dessert fruit really made itself known throughout the dish with its tart sweetness. As the name suggests the skin was ever so crisp and nicely charred, the flesh packed full of flavour just as I remembered it. However my preference would have to be with the older version of the dish, it was so redolent of spice and only softened by the citrus sauce whereas this version was too sweet to be as enjoyable. Poached Organic Pears, Crème Fraiche & Macadamia Praline. After twelve courses it was only natural to have one more in the form of a dessert. Just as last time we had simple pears in their soothing poaching juices but whereas last time there was a big hit of spice this time it was more subdued and all the better for it. Keeping with the light theme the crème fraiche kept the sweetness in check and the final nod towards Australian native ingredients was in the form of some seriously addictive macadamia praline. If we had thought it through we probably would not have gone with the banquet due to the sheer size of it but moderation is not something we know when it comes to dining out. Our mindset of going all out to ensure we don’t miss anything means we are often a little too indulgent but on the flipside it means we never go away wishing we had tried something. If we were to compare our two visits I would have to say I preferred most of what we had on our first visit over the updated versions we had this time around. The main reason is that I felt some dishes had lost their purity or were taken a bit further in the flavour stakes to their detriment. There wasn’t a single dish I disliked but it didn’t have the same impact as it had 5 years earlier. Time to check it out in the new location then. Looks good, the snapper & wallaby my fav’s of the night. Must plan a visit to the Potts Point venue soon.